Tangled and True: baby sparewear. It is true we have talked about baby sparewear before, but now that I've had first hand experience with my own newborn, I am forever grateful for my set from baby sparewear. I won't go into details but it did involve diaper changing in a public place, and left me scrambling to get myself, the baby and surrounding area cleaned up. This is a perfect situation for the baby sparewear sets. 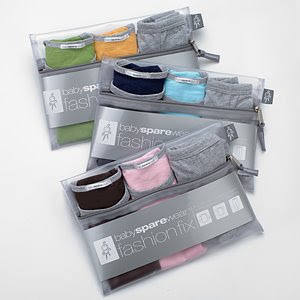 They are stylish, comfortable and small enough to have in your diaper bag at all times. What I hadn't realized before, is that the plastic carrying case is the perfect option for your babies soiled clothing. Genius! It only took this one incident to ensure that I will never be without a set of baby sparewear in my diaper bag. Thank you baby sparewear! Available in infant and toddler sizes (perfect for the potty training days). I love baby sparewear. And not just to keep in the car! The clothes are so soft and durable - perfect for playwear or sleepwear!